Flying with little ones can seem scary, and I know many people who avoid it altogether. This doesn't have to be the case though! We've flown twice now with babies and once with a toddler, and both times the thought of the trip has been worse than actually doing it. You can see what we packed for our toddler Indiana (2) here, but honestly the best thing we did was take the iPad and of course lots of snacks! Then for Parker (and when Indie was a baby) a bottle on take off helped to settle him, and put him to sleep for a short while too. We then found taking it in turns with the baby helped. He was constantly entertained, and it gave each of us a break throughout as well. This is what worked for us, but I'm very aware that all children are different. I thought I'd ask some fellow bloggers for their tips too, so hopefully with this list you'll find something that works for you! 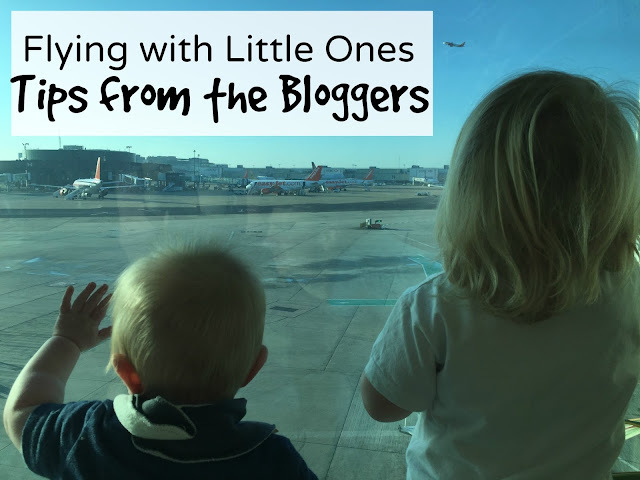 Travelling with little ones is always going to be trickier, but it doesn't have to be stressful - I really hope this list helps and gives you some ideas for the next time you fly. Thank you everyone who gave tips, I know I'll be using these next time we fly! Great list. I will definitely take advice away from that list for when we fly in August.